BRAIDED VINYL TUBING, 1/4 I.d., ft. - F.H. Steinbart Co.
Home / Tubing / Braided vinyl / BRAIDED VINYL TUBING, 1/4 I.d., ft. BRAIDED VINYL TUBING, 1/4 I.d., ft. Braided vinyl is extremely flexible and kink resistant. Suitable for gas, water and juice. Working pressure should not exceed 200 PSI at 70 degrees Fahrenheit. Note: Hose and tubing are non-returnable. 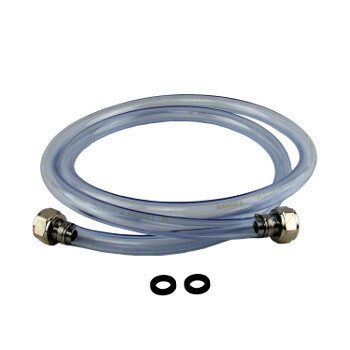 For sanitary reasons all hose and tubing sales are final. VINYL TUBING, red, Co2, 5/16 I.d., ft.
CLEAR VINYL BEER LINE, 1/4 I.d., ft. BRAIDED TUBING, poly., red.stripe, 1/4 I.d., ft. BRAIDED VINYL TUBING, 5/16 I.d., ft.